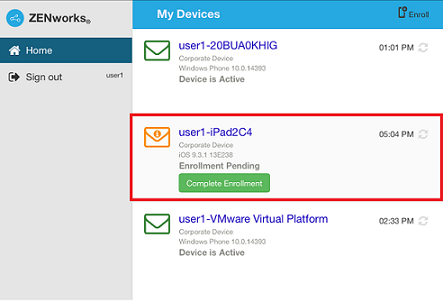 This scenario shows you how to enroll a device as an Email Only device in your ZENworks Management Zone. This scenario details the procedure to enroll an iOS device as an Email Only Device. In a browser on the device, enter ZENworks_server_address/zenworks-eup, where ZENworks_server_address is the DNS name or IP address of the ZENworks MDM Server. You can obtain these details from invite letter or your system administrator. 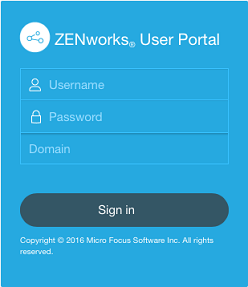 The login screen for the ZENworks User Portal is displayed. 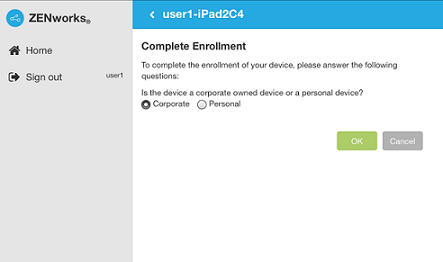 You use the ZENworks User Portal to enroll the device. Enter your username, password, and the registration domain (if required). You can obtain these details from the invite letter or from your system administrator. 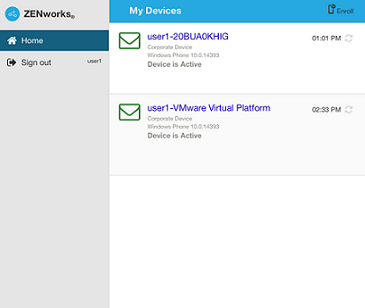 All devices associated with the user, are displayed in the ZENworks User Portal. Tap Enroll on the upper-right corner, to display the enrollment options for the device. Tap Email Only to display the Enroll as Email Only screen. Use the displayed information to create an email account. After configuring an email account, an email is sent to the user stating that the enrollment process needs to be completed. To complete the enrollment process, click the link to the ZENworks End User Portal provided in the email or visit the ZENworks End User Portal as described in Step 1. 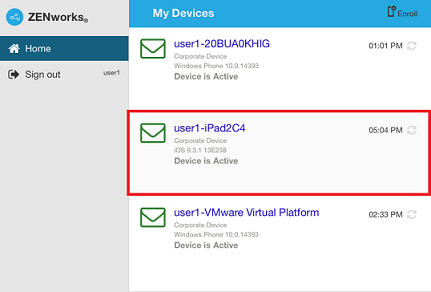 On the ZENworks User Portal, the device is displayed in the My Devices list. At this point, the device has been added to the ZENworks Management Zone but is pending enrollment. On the device, tap Complete Enrollment. Specify the device ownership (corporate or personal) and then tap OK. 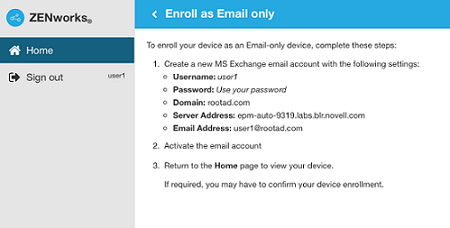 The My Devices list is updated to show that the device is enrolled and active.